To many people the ideals of "period correctness" and "entertainment value" seem to be mutually exclusive. They are not. Many reenactment organizations can fall into the trap of putting these two ideals on the opposite sides a a spectrum. This sort of classification is a very sad thing to me. It is true that focusing too much on one of these ideals can cause you to loose sight of the other, however if you try to maintain an appropriate amount of both, you can have both in large quantities. While they may not be mutually exclusive, having the right balance of each in proportion to your organization is very important. The balance that you prefer should also relate back to the "fit" of whichever organization you choose to pursue. To illustrate this I would like to take a little trip into some of the good and bad aspects that I have experienced with these two ideals during my life. Quite often issues of "period correctness" can become something that a group is very proud of. This, in itself is not a bad thing and I have a lot of respect for people you work very hard to try and gather as much research as they can in an effort to be historically accurate. The problem with this ideal occurs when those individuals try to define themselves by their level of accuracy relative to other groups. Reenactors need to always remember that their understanding of history is based off of the source material that they use. Different groups use different sources. A reenactor should always remember to respect the level of commitment of a particular group to the source that they choose rather than to disrespect the source. If you don't agree with the source, please always try to remember that the quality of a reenactor's accuracy is not in the source that they choose, but in their commitment to trying to improve through the research of those sources. When I was younger, I wore a cape that looked more like it belonged on Batman than on a person in Elizabethan England. A member of St. George got into a conversation with me and while responding to my enthusiasm for my horribly inaccurate outfit, pointed out that the "new" fashion was to wear the capes over only one shoulder instead of both, thus making it into a demi-cape. I was astonished and immediately made the change. 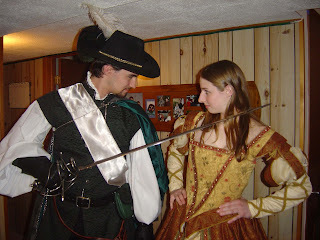 Looking back, I feel that this was the start of my love of historical accuracy in reenactment clothing. 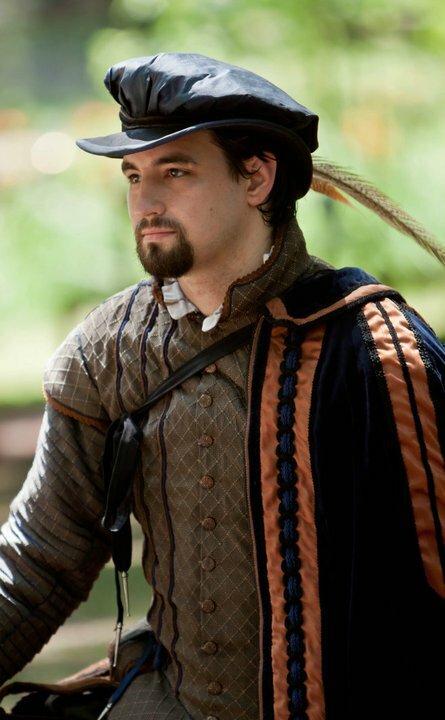 I now know this individual as one of my co-actors at the faire and given his deep knowledge of the period, he could have easily torn my outfit apart verbally, but he didn't! And this is my point. Rather than pure critique, offer options as though you are sharing the joy, rather than judging it. When we look closer at the power of Entertainment we need to look at how and why Reenactment exists. We as reenactors may enjoy the process of simply participating in the reenactment. Not everyone can. Reenactment can take a lot of time, effort and money depending on the extent to which you participate. Not everyone has those resources to give. Many reenactment groups operate for a higher function or goal such as education, entertainment, or simply in memory of an event. In every one of these cases there is an audience at some point. Sometimes that audience is participatory. Reenactment cannot survive in a bubble. Some groups, including many Renaissance Faires focus on the Entertainment value of those who are participating. This isn't something to scoff at. Renaissance Faires are a sort of "collective business", by this I mean that they are a business that is built around the direct and collective participation of those you attend as patrons. If the patrons aren't entertained, they don't come. If they don't come, there is no faire. Without the faire, their is often no forum for the Reenactors. History can be something you live. This is the fundamental attribute of reenactment. Everyone lives history in their own way and we as reenactors should be appreciative of that fact alone. We should all try very hard never to let our pride in historical accuracy overshadow the joy of what we do, but we should always be trying to learn and improve what we do. When joining a group of reenactors, it is important to weigh "period correctness/historical accuracy" along with "entertainment value" and find a group that offers both in amounts that you agree with. There are many, many different forms of Renaissance Reenactment, so many so that I could not possibly cover them all. It is not important to find or discover them all. What is important, is finding one that has a style that suites you and one that is filled with people that you can respect and who will make the experience enjoyable. I will be posting any Renaissance Reenactment opportunities that I can from all around the US along the right hand side of this blog. I invite my readers to explore them if only to see the vast types of history and fun that can be discovered. I invite my readers to post comments with links to any groups that they are familiar with and I will try to get them posted. When it comes to choosing the group that you will participate in, "fit" is rather important. Every group has its own character which is influenced heavily by the members who come and go. As the character of the group changes over time, we each have a chance to bring our own insights to the table. I recommend finding a group who is after the same goals that you are. If your goals are in opposition to the groups goals, it can cause an undue amount of tension or even conflict. In my case, I didn't even know what my goals were until I had been a member of the group for some time. I guess I got lucky. I will go over many many specifics concerning how to get started on your own reenactment journey throughout the blog. The first step is simply deciding that you want to do this! The following is a list of reasons why one should pursue this type of hobby, and a few reasons why someone shouldn't. Please don't be discouraged if you don't see your reasons or inspiration on this list, it simply means that you haven't told me what it is. If you wish to add a reason, please make a comment, and I will add your reason as well as your name to the list! 1) It's FUN. There is really nothing like getting to be someone else. To think like them, to worry about their worries (rather than your own) for a day, can be incredibly liberating and exciting! 2) To Learn. I can't even begin to explain just how much I have learned about life, about history, and about myself through my time as Sir Robert Sidney as well as every other character that I have played throughout the years. 3) To be part of something big. Joining a Faire cast is a big experience. Having others there for you as you put on an amazing show is an awesome thing. The scale and magnitude of such a production is something that you really have to experience to understand. It is well worth it! 4) To make and cherish friendships. The new friends I have made at faire have been some of my most powerful relationships. I would not give them up for the world. 5) To dream. Reenacting can involve a lot of history and a decent amount of work, but in the end, you are getting the chance to BE someone else, or rather, to be a different version of yourself. One of the great truisms of acting is that through exploring other characters, you get to learn more about yourself and you get to live their life. You get to dream! Sometimes, when you get very lucky, you even get to experience some of those great feelings in life that normally only happen a brief few times. 1) Fame. One of the great equalizers of reenacting is that the individuals who often become the most famous, become famous because of how much they help others to be seen. If you really look closely at those few Renaissance Reenactor Celebrities, you will find that they are often some of the most charitable members of the cast. (I am not speaking about stage actors or shows. Many of those actors are amazing people, but they tend to have very different demands on them than a reenactor.) The more you push for the recognition and fame, the further you will become from it. Reenacting is honestly and truly about the team. 2) To look good. Yes, it is hard not to "look good" wearing what we wear. The people we portray had a certain flare for clothing. Their eye for fashion makes our job that much cooler (looking). Reenacting is soooo much more than just being a moving mannequin. You don't have to be the most communicative member of the cast, it really does take all kinds, but you will have to participate. If your only concern is to look good, you will likely never really get what you want out of reenacting. 3) To have people serve you. We, as reenactors, work very hard to give a certain illusion that we are being treated like royalty and that we think of ourselves as such. It is entirely a facade. Those individuals who you see "serving us" are some of the most promising and committed members of our cast. I will drop almost anything I am doing to serve them backstage and that is exactly how it should be. We are a cast, not a group of individual actors. The Household, Yeoman, companions, and retainers are the individuals who make everything we do possible. 4) To have power. You have to give to get. Any person who joins simply to have a title or to feel entitled is missing the point. Yeah, its cool to be Sir Robert, but its a lot more fun to be "the ugly nephew of the Earl of Leicester who just got married without the Queen's permission." And most importantly, an open mind. Blogging about my love of the faire is not a novel idea. Before I can even get started with what it is like to join such a great cast or even the first steps on the road to reenactment, I want to give a nod to the one person who has made my own transition into the world of reenacting such a wonderful time; my sister, Kat. Kat has been one of my own guides as well as the creative power behind each of my faire outfits. You can follow her own love of the faire at theradclyffe.blogspot.com. I make a few appearances. I have found many pastimes, activities, groups, and hobbies in my life. Many have faded until they were simply something I can say that I have done. A precious few have become something much more. Whether compelled by academic necessity, or the love and support of so many dear friends, I have decided to start a blog about one of those hobbies that has meant so much to me and has remained part of my life throughout so many years. Dedicated to each and all of you, I present The Sidney Rogue!